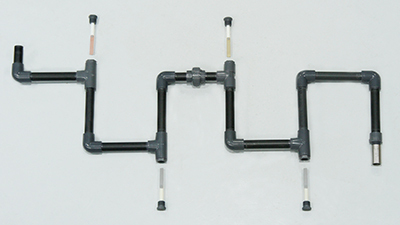 Metal Samples provides conventional or custom-designed bypass piping systems for on-line corrosion monitoring. Commonly used in the industrial water treatment industry to determine the corrosive properties of potable or cooling water, these systems are available in PVC, carbon and stainless steels, and other materials. Bypass systems are easily installed to your existing piping. Normally, all you need is a 1" NPT male fitting on which to attach the bypass. Standard bypass systems come equipped with 4 pipe plug assemblies, 4 pre-weighed mild steel coupons, and a 5-gpm flow control valve. Standard bypass systems are shown here. Please contact the factory for other configurations, pipe sizes, and materials. BA5311139 3/4" NPT Flow Control Body 303 S.S.